Video marketing for article marketers! Article video robot is the world's only software that can convert any article into a video, in just one single click! You don't need to use a camera or do a video editing to make videos with Article video robot. Not only is the software extremely easy to use, but it creates very professional marketing videos with animation, music, graphics and a complete voice-over. As a promotional bonus, we have incorporated our second award-winning software; Video Submit Robot (VSR) inside the AVR. Now you can distribute freshly created video to the top 17+ video websites in a few clicks! If you are a blog or article marketer, then Slideshare is about to change the game for you. It gets over 60 million visitors a month and it is recognized as an ‘authority site’ by Google. This means that having content there will increase your ranking for any desired keyword. In fact, a Slideshare presentation will often rank higher than a normal article for the same keyword. With Article video robot, you can now turn your articles into PowerPoint presentations or slideshows (.ppt files), which we will upload on Slide share for you. Triple your traffic with an additional traffic generating source. We have included a $147 dollar software which turns your passive viewers into active prospects. With our call-to-action video player you can capture leads, redirect traffic and insert call-to-action buttons during various parts of your video. In fact, you can directly close sales from your video player and customize the look and feel a 100%, to match with your website and blog. It is the easiest way to increase your sales. Back-linking to your videos is just as important as back-linking to your webpage’s. Videos which have a lot of links and bookmarks generally get high Google rankings very quickly. Sometimes even beating the #1 site for that search, but social submission is hard and boring and you don't want to spend your precious time doing mundane tasks like creating bookmarks for your videos. Hence to save time and achieve maximum benefit, you can use our Social submit robot software which comes bundled with your account. It will submit your video link to Reddit, Digg, Facebook and a dozen other social sharing websites 100% automatically! Do you have a word press blog or website? Now you can automatically convert your blog posts into marketing videos with just one click using our new Word press plug-in. Not only will our plug-in turn your blog posts into videos, but it can also update your word press site each time you make a new article-video. It provides a Lot of customization options and control on how the videos are published. Professional voice-over can be as costly as $50 / minute, not to mention it can be really time consuming and difficult to sync. Article video robot generates the voice-over for you, using 7 extremely natural sounding human voices that narrate your articles. We have spent a fortune on making sure that your articles sound right. While content is of utmost importance when it comes to Article marketing, video presentation equally matters. Nobody likes to watch blurry, out of sync low quality videos no matter how good the content. Thankfully, with Article video robot you never have to worry about this. All your gorgeous videos can be exported in high definition quality and carry a HD logo on YouTube which makes them stand out in search results. People trust a video more when they see a face in it. For the first time in the history of video marketing, we have created a way for you to put readymade professional human intros and outros in your marketing videos. This enables viewer engagement and increase chances of conversion. Creating a video can be hard, but creating a gorgeous engaging video can be nearly impossible for people without design skills. Your video upload creates your brand image and you do not want to ruin it by uploading amateurish slide shows or photo remixes. Your aim is to present your content in the most engaging method possible. That is why we have hired some of the best designers in the industry who have created videos for some of the biggest brands to design our video themes. Now you can use them to create your own videos. Are you an active article marketer? Do you publish new articles regularly? Article Video Robot can now discover new articles written by you automatically by following your author feed. Just click a button and your new article will be converted to a video instantly. No copy-pasting, no editing. It's that simple. Doubling your article marketing traffic has never been easier! Have a question about Article Video Robot? We are always here to help, 24/7. Our friendly staff will provide all the answers you are looking for, not scripted replies or one-size-fits-all solutions. Plus, there is a full loaded learning centre with video tutorials to help you every step of the way. To create a video, you will need music and photos. But buying stock pictures and music can be very costly. So Article Video Robot comes bundled with more than 5,000 (5 GB of data) Royalty-Free stock photos and hundreds of professional music files to use in your videos. If you like to do everything on your phone or iPad, now you can also create article marketing videos on it too! Article Video Robot is fully HTML5 designed and runs on all mobile phones and devices. There are no messy download or app installations. Just go to www.articlevideorobot.com and you can start working on your new video like you are working from your desktop! 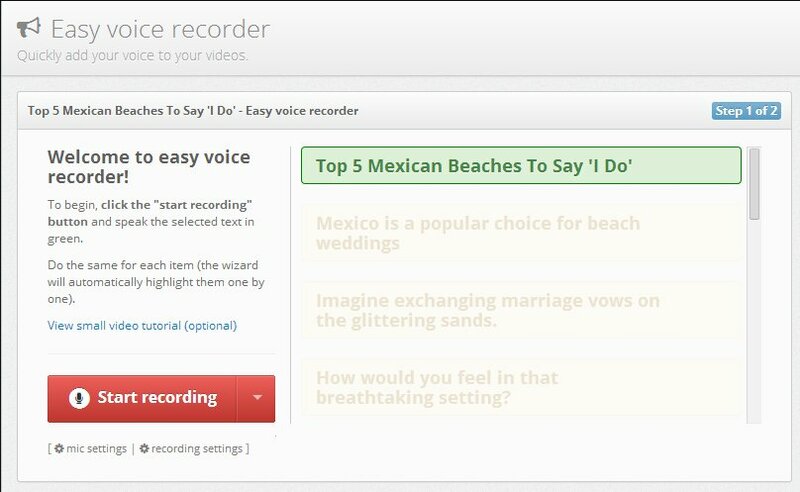 Want to add a custom voice-over to your video but don't have a mic handy? Don't worry, now you can call a special number (US) and record your message over the phone. The message will be added automatically to your video. Now you can record the voiceover for all items in your project in one go. You can use your own voice instead of a computer generated voice using your Microphone or by dialign a US Local phone number. This will help you record the voice over for an entire project in your own voice in a matter of 2-3 minutes. Automatic Video Blog with zero configuration and maintenance. Article Reel is a one of a kind article-video directory. It is your full featured video blog with zero configuration and maintenance. Your Article Reel automatically updates every time you create a new project in Article Video Robot. It's simply a new, easy way to get additional traffic and backlinks for the content you've already created!